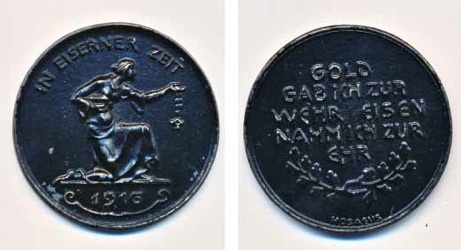 WW1 German Gold for Iron Token Medal. On the front, In the time of Iron, 1916 - On the back, I gave gold for defense and took Iron for my honor. Has Hosaeus beneath the laurel leaves. These were given to civilians by the government when they donated their gold for the war effort. Measures about 14.8 mm. Has 98% of original black remaining. 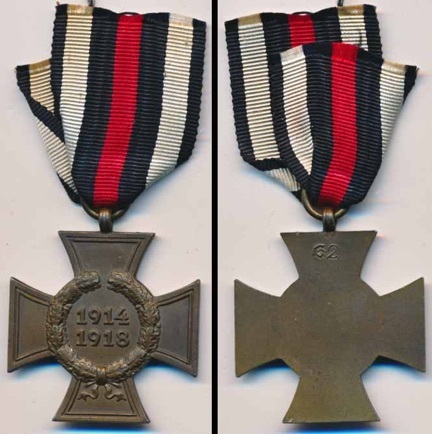 WW1 German Hindenburg Cross without Swords for Non Combatants, Ehrenkreuz für Kriegsteilnehmer. Beautiful bronze Cross measures 38 mm across as do all Hindenburg Crosses. It is maker marked on the upper arm, G2, which is an unidentified maker. It is suspended from about 2 inches of ribbon. Absolutely beautiful Hindenburg Cross for Non Combatants. 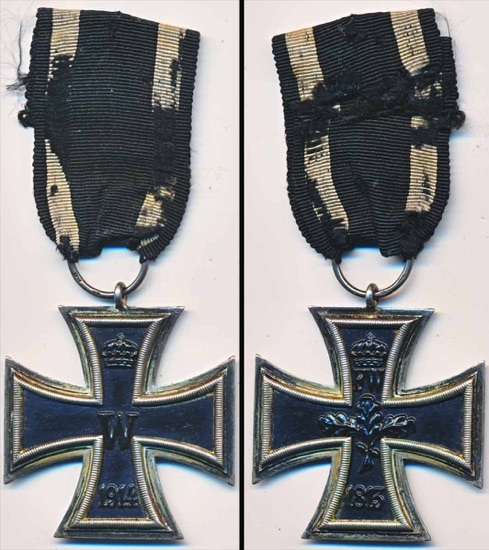 WW1 German Iron Cross 2nd Class, Eiserneskreuz 2 Klasse, measures about 43mm. The Iron center is magnetic. The silver frame has a nice dark patina. The suspension ring is maker marked, 800 cd, for the desirable maker Carl Dillenius. It is suspended from about 4.5 inches of original ribbon, which seems a rarity these days. The ribbon has a lot of wear. Absolutely awesome original Iron Cross! Click here for close-up photos. 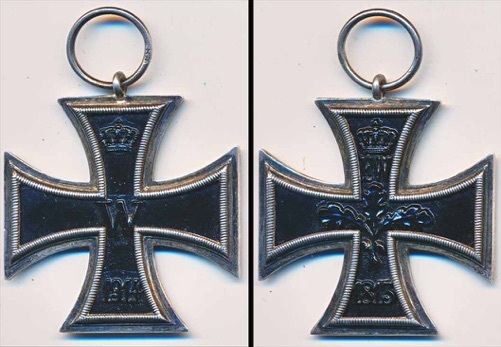 WW1 German Iron Cross 2nd Class, Eiserneskreuz 2 Klasse, measures about 42.5mm. The Iron center is magnetic. The silver frame has a nice even dark patina. The suspension ring is maker marked, WS, for the maker Walter Schott, Berlin. Another beautiful original Iron Cross!